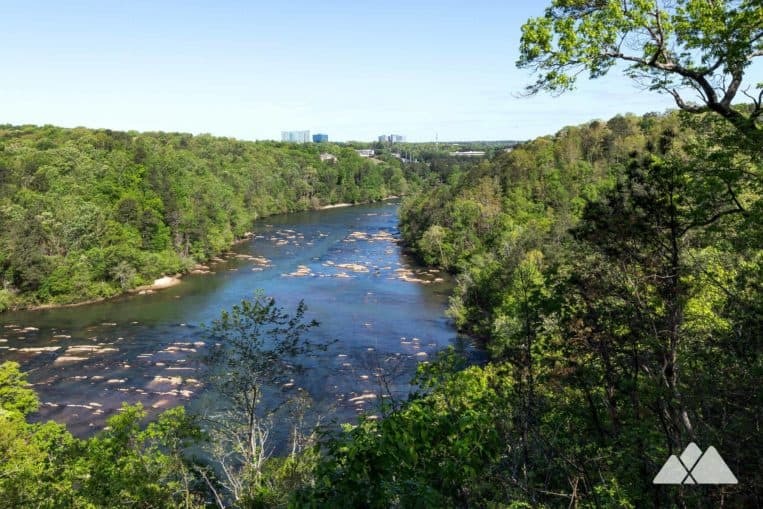 The East Palisades Trail hikes the Chattahoochee River’s Palisades section, one of the river’s most scenic in metro Atlanta. Frequented by kayakers for its Class 1 and Class 2 whitewater rapids, the Palisades are marked by visually striking, sharply angular rock slabs that punctuate the river’s wide flow. Head to the East Palisades for a great in-town hike or trail run – and don’t forget the ENO: it’s one of our favorite places to hammock in Atlanta. The park’s weaving and winding network of trails can be confusing, but nearly every trail intersection is signed with a trail map. It’s still relatively easy to get turned around, though, so if you go, we’d highly recommend running a GPS app to help keep you headed in the right direction. And have fun: it’s is easily one of the best hikes in metro Atlanta. 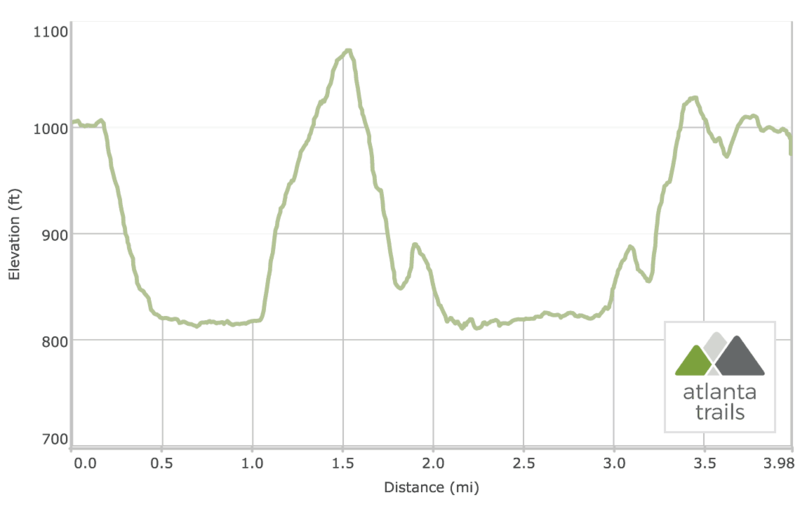 The hike (or trail run) departs from the Indian Trail trailhead (view driving directions) in a continual southwest descent toward the Chattahoochee River. The sound of the Chattahoochee’s rushing whitewater shoals becomes audible as the trail approaches the river and the trail begins to follow Long Island Creek, a small tributary. The trail traces Long Island Creek’s sharp meanders and broad sandy banks before meeting the Chattahoochee River. At the river, the trail turns right, following the grand, wide-flowing river upstream. The trail hikes north, crossing a wooden bridge over Charlie’s Trapping Creek before turning right at the first trail intersection. The trail changes terrain quickly, grabbing elevation and switching back in an ascent to a tall bluff overlooking the Chattahoochee. Views from the platform perched on the cliff are outstanding, stretching upriver across the angular shoals of the Palisades. The trail meanders through a series signed intersections, beginning a northward descent toward Cabin Creek, crossing Cabin Creek and turning west to follow the creek downstream to the Chattahoochee River. Angular shoals dominate the Chattahoochee’s riverbed here, and a small stone building lies in ruins just south of where the trail meets the river. The trail turns north, hiking across an old stone bridge spanning Cabin Creek and passing several large rock outcrops as it follows the Chattahoochee upstream. 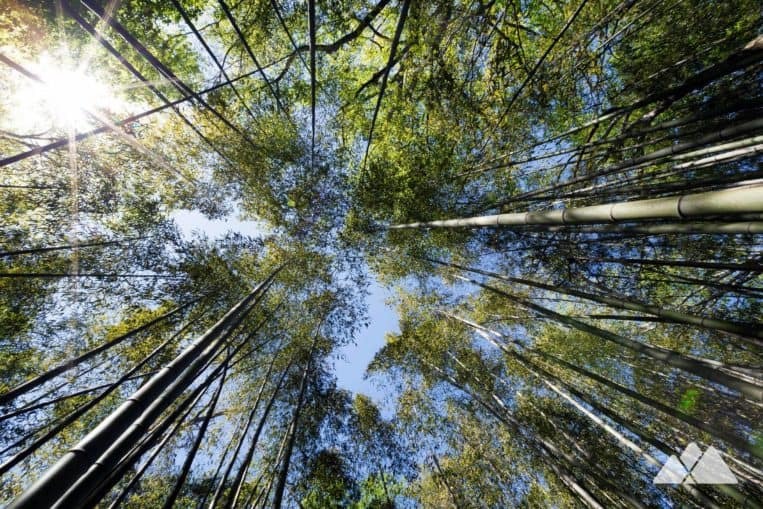 The route crosses a small creek before diving through a grove of 30-foot tall, towering bamboo stalks, meandering through the bamboo forest’s hollow trunks that knock musically in the wind. 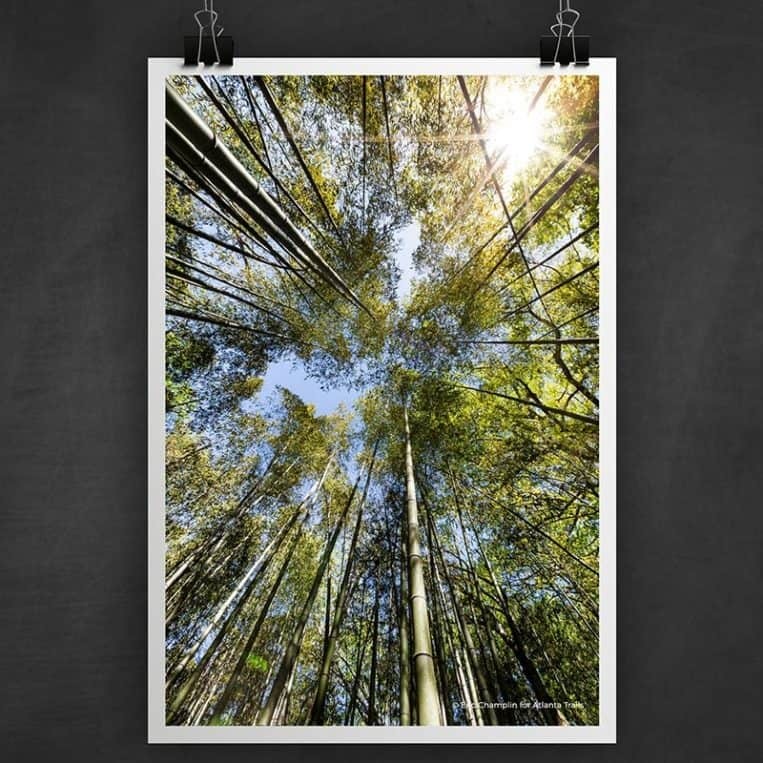 Departing the bamboo grove, the trail continues north to scale a large bluff overlooking the Chattahoochee. 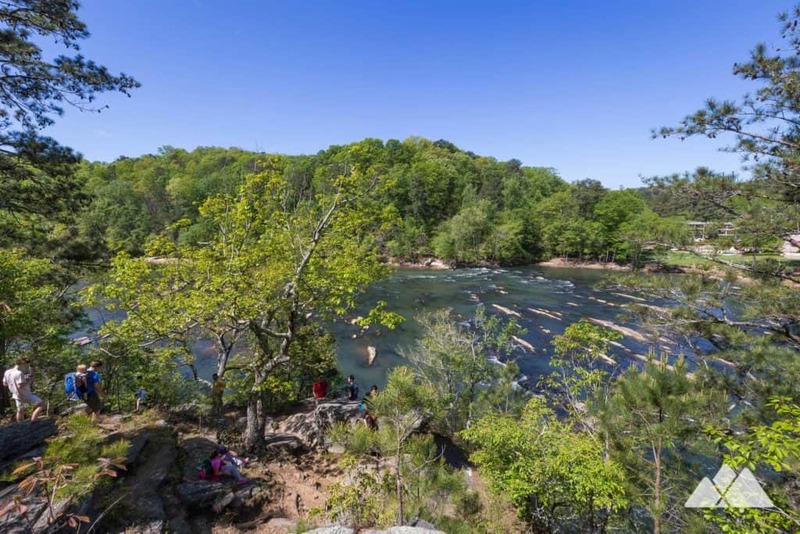 The rock outcrop is steeply pitched and demands a careful climb – but rewards with a fantastic view of the Chattahoochee River and the opposite banks below. The adventure turns here, descending the bluff and retracing the outbound hike to the trailhead. 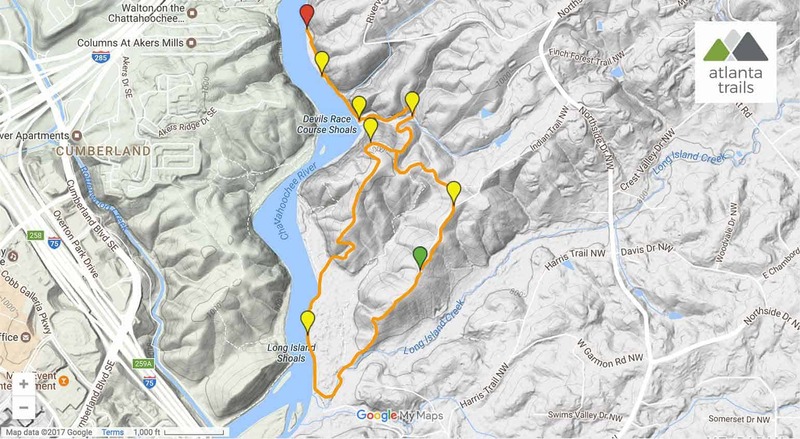 After ascending the through the switchbacks south of Cabin Creek, the hike follows the signed trail intersections to Indian Trail Road, following the gravel road south to the trailhead and parking area to complete the hike. Up for more trail time on this scenic river? 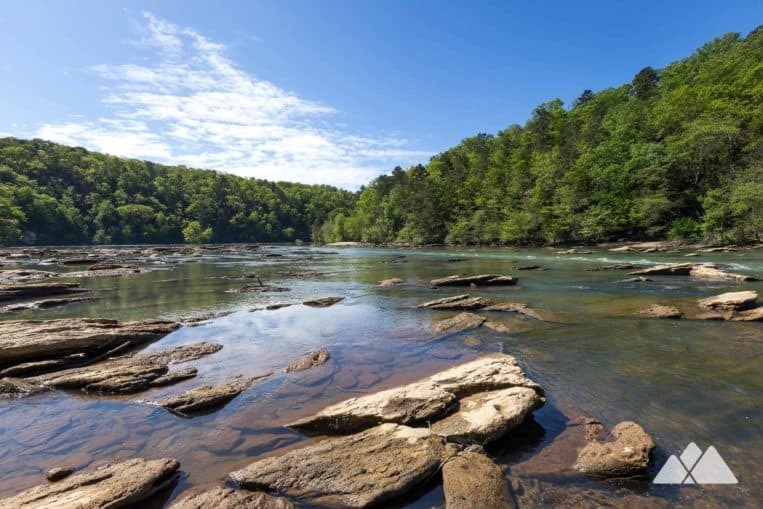 Explore the river’s opposite bank on the West Palisades Trail at Paces Mill Park, or hike across a bridge to a historic island in the Chattahoochee on the Powers Island Trail. Check out our top ten hikes on the metro Atlanta ‘Hooch for some of our all-time favorite hikes and running routes. And our Chattahoochee River map features our all-time favorite hikes on the river’s banks and tributaries.